During the week of March 7th, Conference USA Men’s and Women’s Basketball teams are in Birmingham for their conference tournament. 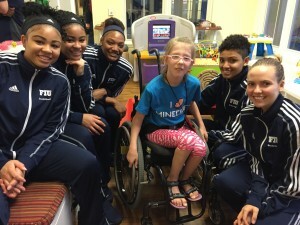 During their time in town, these teams will be doing a lot more than playing basketball. 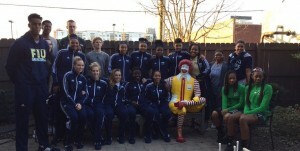 One of those activities included a Community Service night at the Ronald McDonald House. Players, coaches and representatives from five teams representing Conference USA spent their evening at the House. They did everything from man the grill, prepare dinner, play video games with the kids, run around the playground, sign autographs and just spend some time with the families staying at the House. Blaze, UAB‘s mascot even made an appearance before the night was over. This amazing experience was one the families will never forget. These student-athletes are in excellent health — something all the children staying at the House strive to reach. Seeing their interactions was inspiring. One 9-year-old guest, Katie, spends most of her time in a wheelchair. She can walk, but because she has Cerebral Palsy, she has to rest her legs most of the day. She has set goals for herself, much higher than what her doctors have set for her. She wants to run. Something every 9-year-old should get to do. For Katie, being able to see these highly active individuals, was an inspiration. We are so thankful to everyone involved in this wonderful night. To see the excitement from the night, visit our Flickr page to see more pictures.